Viruses can be dangerous, and pave the way for identity theft. We don't delete your data like most shops do. We value your data, and performing a full format is not an option. We have a 100% success rate. We get rid of viruses. Standard computer virus removal, and Advanced malicious removal. The standard types can usually be removed in under an hour; The advanced variations usually take longer, sometimes up to 3 hours. We love Microsoft Windows, and understand it very well. Computers can throw you a curve-ball from time to time. Usually, if the term "quirky" describes the symptom, a simple restart can help get things back on track. In some cases though, there are underlying issues, which need to be addressed and corrected. Either way, we've got your back. Give us a call, and we'll try and help you correct the problem first, and if it requires a visit, we'll set up an appointment. Everybody knows things break down over time, and your computer is no exception. Computer hardware is computer hardware. It doesn't matter to us whether it's a Mac or PC. Laptop computers have been known to overheat, causing the internal components to break down faster than usual. When we service a laptop, we always check out the cooling system to ensure your laptop lasts as long as possible, and your lap stays cool. We support all laptop and desktop hardware. Upgrades are also performed, if necessary or requested. Slow computers are frustrating to use, and counter-productive. PC Tune-up software is so common these days, but try finding one that actually works. Most don't. In fact, many are viruses or "friends" with viruses. Often times, trying to speed up your computer on your own can lead to even worse performance. Our services cover every aspect of your computers' performance. We check the computer for errors, bottlenecks, fragmentation issues, unnecessary and inefficient processes, registry fragmentation, and other processor intensive applications and services. Once we have a good feel for your system, we make meaningful changes that will increase your productivity dramatically. We may have an article that can help speed it up, for free! Thanks for visiting! Manley Computers proudly provides computer repair, in Griffith Indiana. Computer Repair Griffith, Computer Repair Griffith Indiana, Laptop Repair Griffith Indiana, Griffith Indiana Computer Services. 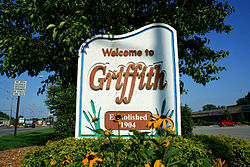 We proudly provide computer repair services in and throughout NWI including Griffith Indiana.